Kanner Architects' Futuristic Gas Station: Almost There? 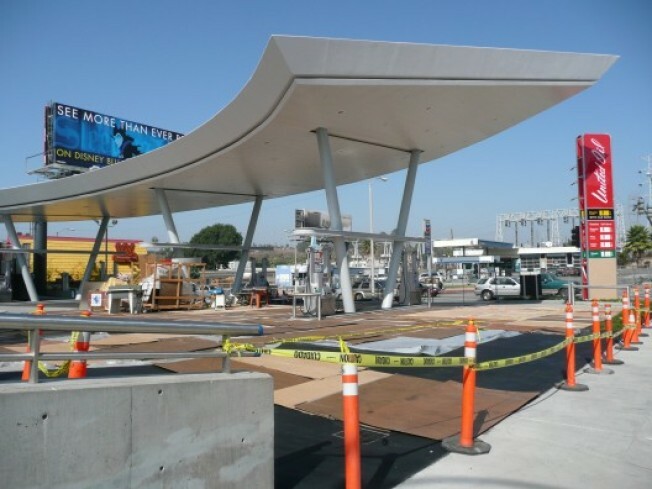 It looks like that futuristic United Oil station/car wash at the corner of Slauson and La Brea avenues is nearly done, but is work still going on? We hope so. According a report in Architecture magazine, it was supposed to be finished in June 2007, but earlier this year, there was chatter on the site that the client was "indecisive." Aren't they always. Here's a description to tide you over: "Designed by Santa Monica, Calif.–based Kanner Architects, the station captures the momentum of nearby freeways with two sweeping gestures: a concrete ramp to the car wash that winds around, over, and behind the market, and a steel structure that forms the roof of the market, then curves around to become a soaring canopy over the pumps."